Who can resist truffles and/or porcini mushrooms? Not me. 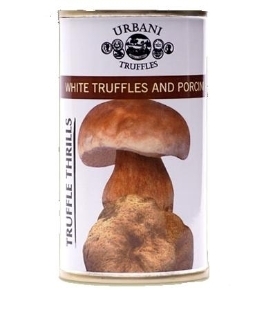 So today, being in the mood for self-indulgence, I acquired this small (6.1 ounces) can of white truffle and porcini cream sauce. It didn't come cheap, of course; it set me back thirteen dollars. But it was delicious right out of the can onto the pasta (Delverde tagliatelle), with a bit of extra salt and freshly-ground black pepper. The can is enough for two medium-small portions of pasta. It can also be used on bread, crostini and according to the producer itself, with meat or fish. But I would limit myself to the first two options. Urbani is a well-established company based in Umbria, but has had a presence in New York for over a year now. Their site is here.